The Santa Barbara Courthouse is situated on an entire block within the downtown core of the city, a site of 450 feet by 450 feet for a total of 4.65 acres, and lushly landscaped with a wide variety of trees, shrubs, climbing vines, and flowers. A number of the mature trees on site were planted when the building was dedicated in 1929. The majority of the landscaping is contained within a semi-formal garden that frames a series of terraced lawn areas approaching the west façade where a public stage provides an outdoor performance venue. The landscape architect designed this series of terraced lawns to provide for public presentations, gatherings, community functions, debates and civic interaction. Among the plantings are 57 varieties of palms, Coast Redwoods (Sequoia Sempervirens), Saucer Magnolia (Magnolia X Soulangiana), and Giant Sequoia (Sequoiadendron Giganteum). 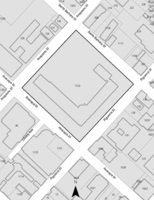 The general design and layout of the courthouse follow a modified Spanish castle plan. The building is placed on the site so the most important rooms face south for natural heat gain to warm these spaces. 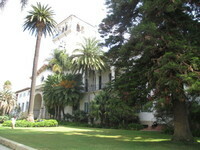 There are many castle defensive elements used on the Santa Barbara County Courthouse. 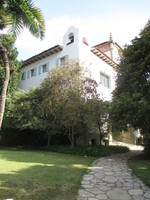 The architect used these Andalusian-Spanish castle elements as metaphorical connections to the Spanish roots of Santa Barbara and many of the design details are also metaphoric of castle defense elements. The courthouse is the seat of government for Santa Barbara County, much like a castle is the seat of its ruler. The courthouse complex is comprised of four buildings connected by either a bridge or arch, taking an overall form much like a capital "L." Because these buildings were constructed at the same time and are interconnected by arches and bridges, they are considered one building for the purpose of the National Historic Landmark designation. The main façade of the building that faces Anacapa Street (south) stretches across the site some 370 feet. The Figueroa Street façade (east) is 356 feet and the Santa Barbara Street façade (north) is 161 feet. The building height varies from 40 feet up to 111 feet. The site changes in elevation by as much as four feet, dropping to the East. The sunken gardens drop below the level of the main arch entry paving by six feet. The general "L" shape of the building protects the garden (also called a "bailey," in castle terms). The clock tower observation deck (El Mirador or "keep," in castle terms) rises 88 feet above the ground entry level. This height provides the best defensive vantage point across the garden, the main entrance, and outer points in the approach of the courthouse. The Rotunda, located at the intersection of the Anacapa and Figueroa wings, provides access to the alarm bell located at the outside southeast corner of the building. The northeast corner of the courthouse is defended by means of a turret with lancets, machicolations and embrasures. Architect: William Moser and William Moser, Jr. 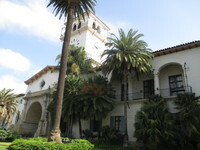 The Santa Barbara Courthouse was constructed in 1929 and is a complex of four buildings occupying an entire city block in downtown Santa Barbara. It was designed by master architect William Mooser in the Spanish Colonial/Moorish Revival style. It is an extraordinary example of its style, with an elaborate array of detail emulating a Spanish castle or fortress. 7) Its unique location and singular physical characteristic representing an established and familiar visual feature of a neighborhood.